Uchida drills offer the widest possible choice of size, capacity and sophistication. User friendly with either sliding tables or side lay stops. All models marked meet HSE guidelines. Suitable for conventional and computer stationery. They are ideal for reprographics department, printers, binderies and offices. 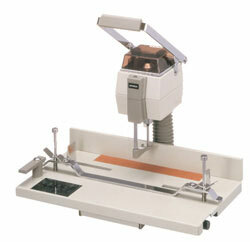 The Uchida VS25 is a single spindle drill for use with A4, A5 and foolscap paper. Programmable for 2, 3 or 4 holes, up to 50mm pile height, table top paper drill.